The high-performance material graphene has great potential for use in biosensors. However, new production techniques are required for a rapid transfer of research results from materials science to industrial applications. In the project, BIOGRAPHY, methods for automated roll-to-roll printing of graphene based electrode structures and their protein coating were developed for industrial-scale production of biosensors. A new graphene ink was developed and tested for biocompatibility, conductivity and printability. Printing cylinders were directly patterned using a newly developed micro-engraving machine with an ultra-short pulse laser. 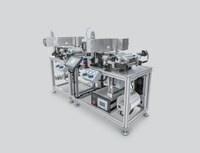 For sensor production, a roll-to-roll printing system was established. Biosensors with graphene electrodes were roll-to-roll printed with the new printing machine and tested for their suitability for automated validation of antiviral substances and for conducting toxicity tests. Compact two colour roll-to-roll printing machine with integrated corona unit for surface activation and near-infrared drying units. Process for patterning of micro-engraved printing cylinders: Structures with lateral dimensions < 10 µm were achieved. Biocompatible graphene ink suited for gravure printing. The printed structures have a square resistance of 10 Ω/sq at 25 μm. Process for printing biosensors comprising interdigitated electrodes down to 50 µm in width. Single sensors and biosensors in multi-well plate format, integrated in incubators with customised sensor readout-systems, are ready for use in the labs of the project partners AiCuris Anti-infective Cures GmbH and cellasys GmbH.